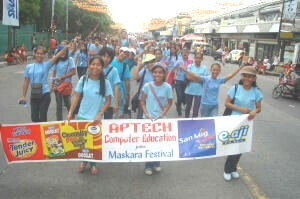 MITC joined the parade together with Megumi Academy students. 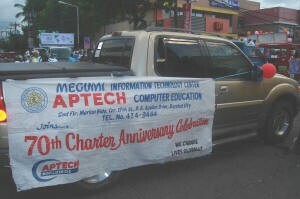 They were behind Megumi Academy float. The muse in the float wore Japanese costumes. 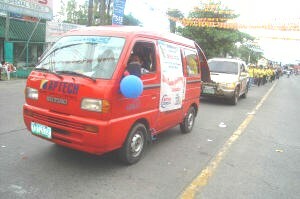 The float was made possible through the cooperation of students and faculty working together in unity. In fact, they slept in school finishing the float for the next day. Truly you could see that this kind of cooperation among the students and the teachers is the manifestation of good working relationship in the school. Inspite of the heat and the coping up of time for the parade, you could feel how good the inter and intra personal relationship among students, teachers and administrator. Many positive reactions from our student especially from the parents because of the apparent media pronouncement on MITC Advetisement which they often hear during the Masskara Festival. They are proud and happy as a student of MITC.